inspired by my gorgeous grandson, i wanted so badly to make a blanket to celebrate his arrival. with limited skills, i started in the spring, shortly after hearing he was on his way to our world. 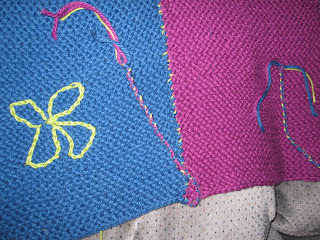 the plan was to knit up little and not so little squares. 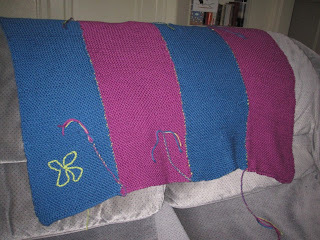 at this point in my knitterly career, i was a novice (read: a very slow, deliberate knitter with not much experience). 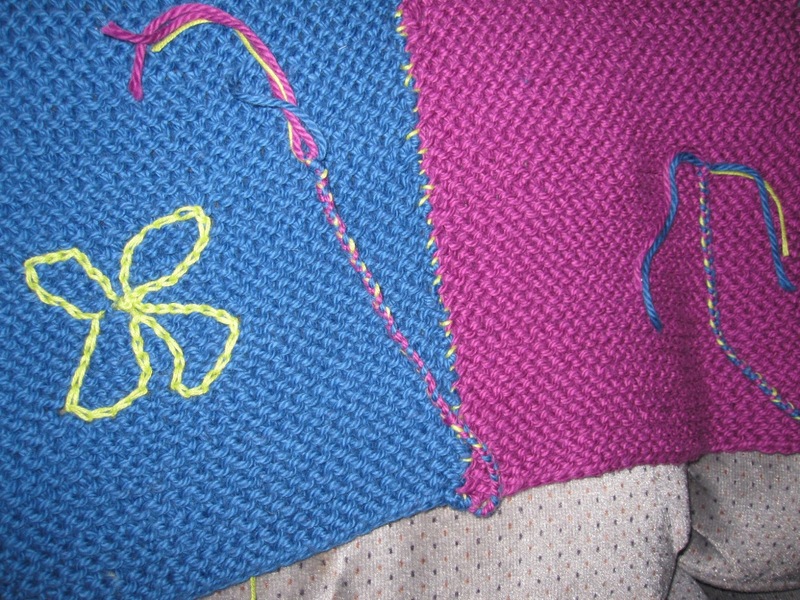 the idea of making a bunch of squares and then sewing them together felt a bit daunting. panels won out. i chose the cloud cotton yarn~love how it feels and looks ... didn't want to do anything traditional in the way of a pattern or colours. ha! who am i kidding, i couldn't read or follow a pattern! and as you can see, i did my best to resist pale pinks, yellows and baby blue all of which give me the willies. courtesy of the rebel within. my intention was to knit something funky for the little one. perhaps i could add something more to the solid colours. 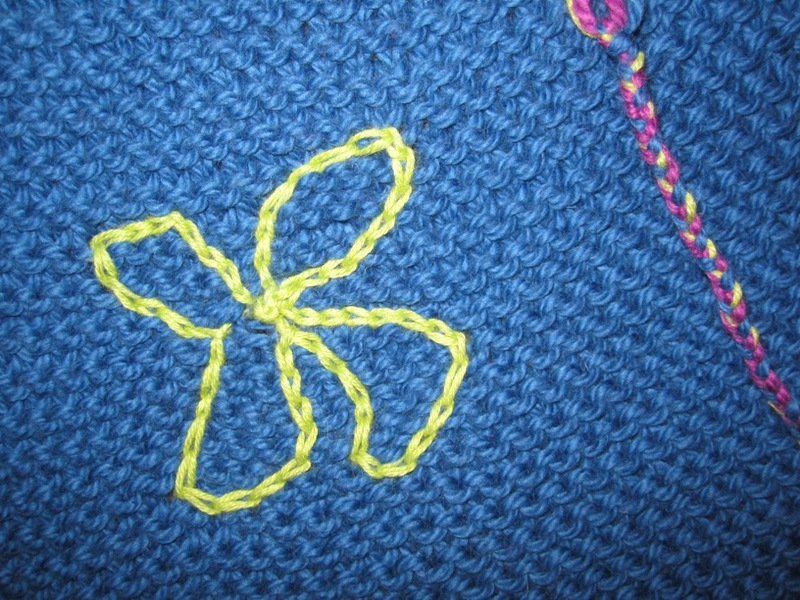 i wondered if it was possible to embroider some flowers and shapes onto yarn. well, after a bit of research online and discussions with more experienced knitters, i would give it a go. 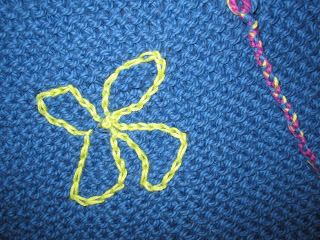 the yellow flower is crocheted (i have never crocheted anything in my life!). i used to work on crewel projects and a bit of embroidery in my teens...alas and alack i digress. amazing grace. thread formations of long ago came back to me, just when i needed them..
with all four panels finished, i joined the sides using some sort of cross stitch meets free form. instead of weaving the ends in, i thought it would be fun to braid them and leave them dangling. i was anxious. it was taking forever to complete. and would they even like it? at last i stepped away from the clutches of worry. i was thrilled to bits with the result. i learned to stare down the perfectionist dragons around me and breathe life into the blanket. a few more finishing touches were needed. i stitched in a sprinkling of other little flowers and stars and things here and there. the blanket was received with much happiness and appreciation...the only thing was that the braids became a source of what if, so i decided to cut them off, sew in the ends for safe keeping. for the love of my grandson.